Today I found out bananas are naturally radioactive. This comes from the fact that they contain relatively high amounts of potassium. Specifically, they contain Potassium-40, which is a radioactive isotope of potassium. The fact that bananas are radioactive has actually given rise to the radiation unit: “banana equivalent dose” (BED); this is the average amount of radiation you are exposed to by eating one banana. The banana equivalent dose is occasionally used to help conceptualize the relative danger of various radiation sources and amounts; for instance, the amount of radiation typically leaked by a modern nuclear fission reactor. This leaked radiation is typically extremely small, typically in the realm of a picocurie, which is a millionth of a millionth of a curie. This latter measurement doesn’t make a whole lot of sense to most people, thus the banana equivalent dose was introduced to give an easy way to understand whether X amount of radiation is harmful or not, given that you know bananas aren’t harmful. For instance, living within 10 miles of a typical nuclear power plant will expose you on a daily basis to just a bit more radiation than you’d get from eating one banana a day. Now before you start boycotting bananas because of the above association with nuclear reactor radiation leakage, consider that, to cause illness in a person, it takes about 100 rems. (Roentgen Equivalent Man: 1 rem = the quantity of ionizing radiation whose biological effect is equal to that produced by one roentgen of x-rays; basically, a measurement of how much radiation a person is exposed to.) So given eating one banana a day for a year only exposes you to 3.6 millirems, you’d need to eat about 10,000,000 bananas in order to reach that amount [100 rems * (1000 millirems / rem) * (365 bananas / 3.6 millirems)]. Not only should you not worry about eating bananas because of the radiation, but barring some major reactor meltdown, you shouldn’t really worry about living near a nuclear reactor either. In fact, recent research has even begun to indicate that these extreme low level amounts of radiation you experience from the cosmos, bananas, and the like, may actually be beneficial to your body. And as far as major reactor problems that might come up go, if you camped out at the plant at Three Mile Island during the accident that happened there in 1979, you’d have received only an additional 80 millirems of exposure during the duration of the accident. Granted, you’d need to eat about 8000 bananas to reach that level from bananas, but if you’ve ever had your spine x-rayed, you’d have received about double that just during the few seconds of the x-ray. If you were around ten miles away from the reactor during the accident, you’d have received about 8 millirems or about the equivalent of 800 bananas. There are no known deaths/cancers/etc that resulted from this event. Public reaction to Three Mile Island was way overboard from what the actual event warranted as you can see from the banana equivalent dose. This was largely due to misinformation in the press; misunderstanding of radiation among the general public; and the fact that, not 12 days before it happened, the movie The China Syndrome was released. The plot of the movie was basically how unsafe nuclear reactors were and that just about everyone in the movie but one of the main characters was trying to cover it up. The China Syndrome movie title’s concept comes from the premise that if an American nuclear reactor core were to melt down, it would melt through the center of the Earth to China. Getting around the fact that it is actually the Indian Ocean that is on the opposite side of the Earth from the U.S. and the obvious problems with the “melt through the Earth” premise, it couldn’t have been a better timed movie as far as free advertisement through the press due to the Three Mile Island incident. The movie was nominated for several academy awards, including best actress by Jane Fonda. So in essence, the banana equivalent dose is basically a measurement used to help quell the media hysteria that always surrounds nuclear reactors and other potential radiation sources like cell phones and the like. Basically, trying to show people that radiation is everywhere (literally) and most of it isn’t harmful at the levels we are typically exposed to, despite what you might read in the news. If you live at high elevations, like Denver, Colorado, you are naturally exposed to about 50-70 more millirems per year than living in, say, Seattle, Washington (sea level). Being next to the Rocky Mountains will net you exposure to about 40 extra millirems per year, due to the uranium in the soil. If you live near the Atlantic Coast, you’ll get exposed to an extra 55 millirems a year from the air you breathe. Every U.S. coast to coast round trip flight will expose you to about 5 extra millirems per trip. A chest x-ray will expose you to about 8 millirems; a head/neck x-ray will expose you to about 20 millirems; a lumbar spine x-ray will expose you to about 130 millirems. On average, a person living in the United States will naturally be exposed to somewhere around 360 millirems (36,500 bananas) of radiation per year, with the vast majority of that (300 millirems or so) coming from the sun, soil, rocks, and other natural sources. If you sat about 1 inch away from your tv-set, you’d receive about .5 millirems per hour. If you work with concrete a lot or live or work in a concrete building, you receive an extra 3 millirems or so a year. At around 100 rems (about ten million bananas), you’ll contract mild radiation sickness. Early symptoms of this are very similar to the flu. This will also leave you more susceptible to infections, leukemia, and lymphoma. At around 200 rems, you’ll start having damage to your gastrointestinal tract, which will cause nausea, bloody vomiting, bloody diarrhea, and abdominal pain. You’ll also start having damage to cells that multiply quickly, such as blood cells, reproductive cells, hair cells, etc. At this point, you’ll typically lose your hair, possibly permanently. At around 300 rems, your body’s immune system will likely be permanently damaged. At around 400 rems, you have a 50/50 chance of dying within 60 days if you don’t get immediate treatment. Other common foods that are naturally radioactive include potatoes, sunflower seeds, many nuts, and kidney beans, among others. Among these, Brazil nuts are the most radioactive by far at 6600 picocuries per kg or about 1.875 BED (banana equivalent dose). The radium in Brazil nuts does not come from especially high levels of radium in the soil where the trees grow, but rather the very extensive root systems the trees develop, which cover a much larger area of the soil than most trees. Despite the name, the primary exporter of “Brazil” “nuts” is Bolivia, who account for about 50% of Brazil nuts exported world-wide. They are also not nuts, but rather seeds. So the whole name is a lie. Brazil nuts are radioactive due to containing radium; your body doesn’t need radium, unlike the case with bananas and potassium. 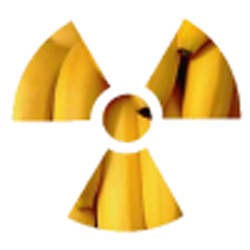 Although bananas contain very little radiation, they are radioactive enough to trigger false alarms in some radiation sensors used to detect illegal smuggling of nuclear materials. About 89% of the time Potassium-40 will decay into calcium-40 and 11% of the time it will decay to argon-40. This latter fact is important when dating rocks as the time elapsed since a rock last cooled from a molten state can be measured by looking at the levels of Potassium-40 and Argon-40 contained in the rock. This is because, when the rock is in a molten state, it releases the argon contained within itself. Once it is solid, it contains no argon initially. When the potassium-40 breaks down into argon-40, the argon cannot escape. This makes for a nice way to measure the age of a rock since it was in a molten state. After the nuclear accident at Three Mile Island, local milk contained radiation levels of about 20 picocuries/liter. This is about 1/75th the banana equivalent dose (BED) in a 12 ounce glass of the milk. Now the Chernobyl disaster was a whole different story, but that was a result of a lot of idiocy more than anything. It was a case where one of the reactors was intentionally put in about the worst possible state it could be in, all the while the operators ignoring all the warnings and overriding many of the automated safety systems. It was actually a testament to the safety systems that the reactor they were messing with lasted as long as it did with what they were doing with it. Even after the explosions, the workers who were managing the reactor next to the exploded one were told to keep the other reactors online and continue to work. It wasn’t until a few hours later that one of the engineers, Yuri Bagdasarov, made the decision to override his superior, Nikolai Fomin, and shut down the reactor adjacent to the exploded one and have everyone who wasn’t absolutely necessary for emergency cooling systems leave. The mistakes didn’t stop there though, the exploded reactor crew chief, Alexander Akimov, assumed the reactor was still intact, despite all the graphite and reactor fuel lying around the building after the explosions. So he kept everyone working throughout the night on the exploded reactor core which cost many workers, including Akimov, their lives. One of the problems was that, of the two dosimeters capable of measuring the radiation levels they were experiencing, one was inaccessible and the other failed to turn on. All the other meters couldn’t read that high; indeed, they didn’t read very high at all, so they only knew the radiation levels were somewhere above 3.6 rems per hour, which is a relatively high rate, but certainly not going to kill anyone working there for a shift. When they eventually brought a meter in that could read the correct levels, Akimov assumed it must be malfunctioning because of the extreme high readings they were getting. Once again, you’d think the nuclear fuel and graphite lying around the building and the two explosions would have tipped him off, but here we are. In his defense, at around 5000 rems, the brain begins to be damaged with the radiation killing nerves and small blood vessels. He wasn’t likely experiencing these levels where he was working, but lower high levels, while not causing brain damage, will cause memory problems; confusion; information processing ability problems; and decline in cognition. So that may have played a role in his poor decisions after the explosions. The next mistake was with the rescue crews that arrived on scene. Many of them knew nothing of radiation and some even directly handled some of the radioactive debris lying around that was emitting as much as 15,000 rems per hour. The mistakes didn’t end there and, in the end, an estimated 60,000 people were exposed to high levels of radiation; of which, about 5,000 people died within five years of the explosion from problems stemming from radiation exposure. Note to self: when working at a nuclear reactor and there are a bagillion warning lights going off over the course of a few hours telling you to stop doing what you are doing, maybe you should think about not overriding said warnings and maybe, instead, stop what you are doing. I’m just throwing that out there. Firefighters on scene at Chernobyl described the radiation as “tasting like metal” and feeling sensations of “pins and needles” all over their skin. Is Chronic Radiation an Effective Prophylaxis Against Cancer? Don’t forget that your body is naturally radioactive because part of the carbon in it is carbon-14. John Coleman, author of “The Committee of 300”, says that fears about nuclear power plants were purposely overblown by the powers that be, because nuclear power would mean that 3rd world countries could support themselves without foreign aid, thus taking control of their own resources. I suspect it wasn’t a baffling case of stupidity that caused Chernobyl to melt down. I think the per year was a mistake and you meant one trip. In my time wearing a dosimeter and working around radiation, we always used rem and millirem as singular. Thus they were always rem and millirem, as in 10 rem and 20 millirem. Hi, I had a weird experience the other day that led me to your article. Maybe you have a response to what happened? We opened a banana, and noticed extremely fine looking fibers, almost hair like, coming out of the banana after top was accidentally ripped off. When I put my finger up to it out of curiosity, the fiber instantly leaned towards my finger, and followed it wherever I moved it. My Dad then put his finger up to see if he had the same reaction, and it actually had the opposite reaction: The fiber would actually move away from wherever his finger was. It seemed as though the Fiber was magnetically charged, and my finger had the same charge, while my father’s had the opposite. Any idea why this happened, and why my father and I would have opposite charges? @Tyler: Aliens… 😉 In truth, I think you’re probably right in your static charge theory.